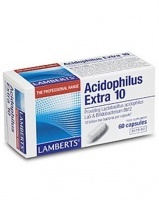 The acidophilus and other bacteria have been selected for their specific, scientifically proven qualities such as their ability to survive to reach the gut alive. 'For every day' contains a variety of well-researched and documented strains, which are thought to settle in different parts of the small and large intestine or colon. Like the rest of the OptiBac range, 'For every day' (formerly 'For daily wellbeing') does not require refrigeration. Research on probiotics continues to show that different strains (types) have different beneficial effects on the body. OptiBac Probiotics recognise this, and use well researched strains that have been scientifically tested for their specific health benefits. This way, their range of 11 probiotic supplements is sure to offer you a tailored supplement that you can trust. 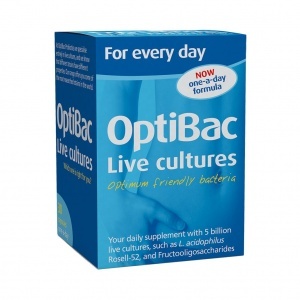 OptiBac Probiotics only use well-researched strains of the highest quality which are second to none on the UK market. As well as clinical trials, all of Optibac probiotic strains undergo rigorous tests to ensure their ability to survive at room temperature, and to survive stomach acidity. Number of live probiotics guaranteed until expiry. OptiBac Probiotics specialise entirely in probiotics, and in particular use specific probiotic strains to target specific health conditions. Recognising that different types of probiotics can have different beneficial effects on the body, they aim to offer each customer a specific probiotic formula in order to support their individual health needs. Our most popular and powerful probiotic.